Multiple exposures are made to collect enough light for an image that would otherwise not be evident to the eye. 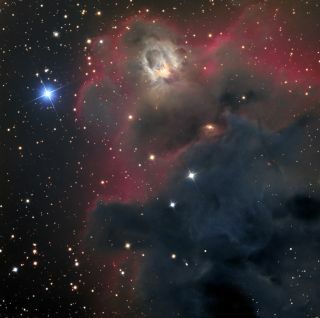 The picture was taken by skywatcher and photographer Adam Block from the University of Arizona's Mt. Lemmon Sky Center during December 2011. LDN 1622 is called a dark nebula because interstellar dust is so thick it obscures light from nearby stars or other nebulas. It is located near the plane of our Milky Way Galaxy close the Belt and Sword of Orion, an area that can be a favorite observing ground for avid skywatchers. "My first impression of this nebula, especially looking at the raw grayscale images, was of a Native American woman dancer. She makes a cloud of dust as she twists in her movement. Perhaps I am influenced by where I reside, but the impressionistic form seems sinuous and kinetic," Block told SPACE.com in an email.